Protecting sealing surfaces like conflat flanges, VCR glands, and compression fittings from corrosion and keeping them inert is important to maintaining sample transfer system integrity and process reliability. Corrosive attack around seal areas can dramatically shorten the life of process systems while particulates generated from internal corrosion can result in contamination of process fluids and will increase surface reactivity. 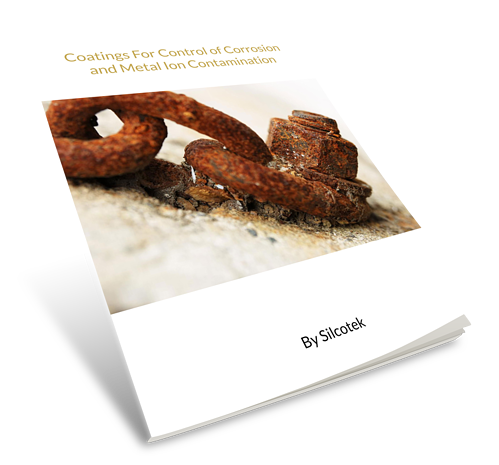 The benefits of applying a corrosion resistant CVD coating to seal areas. How amorphous silicon coatings maintain a leak tight seal. How Silcolloy® and Dursan® coatings perform in corrosive environments and help to prevent crevice corrosion. How bio-inert coatings can prevent cross contamination at seal areas. SilcoTek® coatings are proven to withstand compression and shear stress common to CF, face seal and threaded systems. That gives customers a new option when looking for improved corrosion resistance, durability, and inertness in sampling and process systems. Exposure to corrosives can pit surfaces and compromise seal integrity. That's why it's important to protect against crevice corrosion. It makes sense to protect the seal area but can a corrosion resistant coating hold up to the stress associated with making a leak tight seal? Amorphous coatings like Dursan® and Silcolloy® are bonded to the metal surface and are durable and flexible enough to withstand sealing stress. In addition, resistance to common corrosives like nitric, sulfuric, & hydrochloric acid is improved by up to 10x or more. 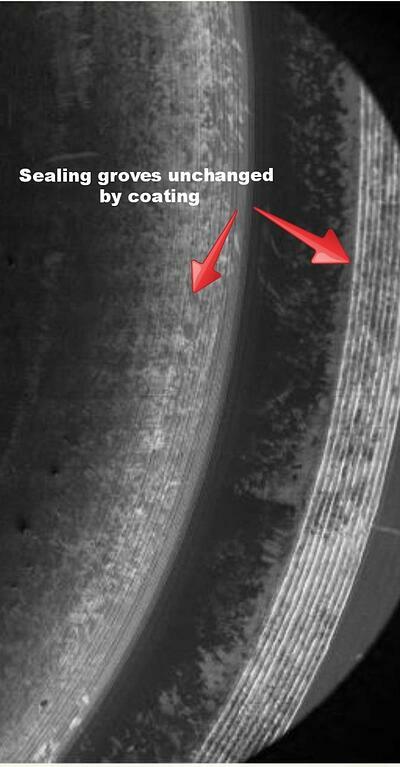 Coated seal areas help prevent crevice corrosion as seen in the example below. ASTM G48 ferric chloride immersion testing shows major crevice corrosion on uncoated 316L stainless steel coupon. 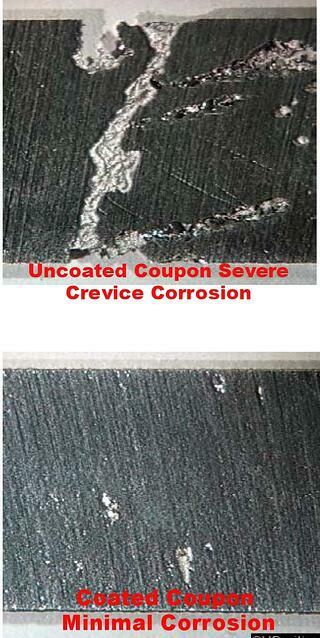 Corrosion resistant coatings minimized the damage to the second coupon (bottom image). Sticky compounds like proteins can hide in seal areas. 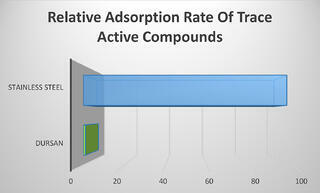 An uncoated fitting can also react or adsorb sulfur, ammonia and other active or reactive compounds. SilcoTek inert barrier coatings prevent interaction with surfaces, making the fitting or seal area non reactive and non stick. This prevents cross contamination and inaccurate test results. Dursan coated stainless steel prevents protein sticking, allowing easy rinse of molecules and preventing carryover and cross contamination of samples. Improved rinsing means less retention of molecules around seal areas. Let's see how a coated face seal stands up to the stress. First we'll examine the coated surface before sealing. FESEM (Field Emission Scanning Electron Microscopy) image of the coated pre-sealed surface shows the coating conforms to the sealing area. The raised surfaces of the gland area can be seen. SilcoTek® coatings conform to surface contours and small orifices. Now let's make the fitting, disassemble and examine the surface. 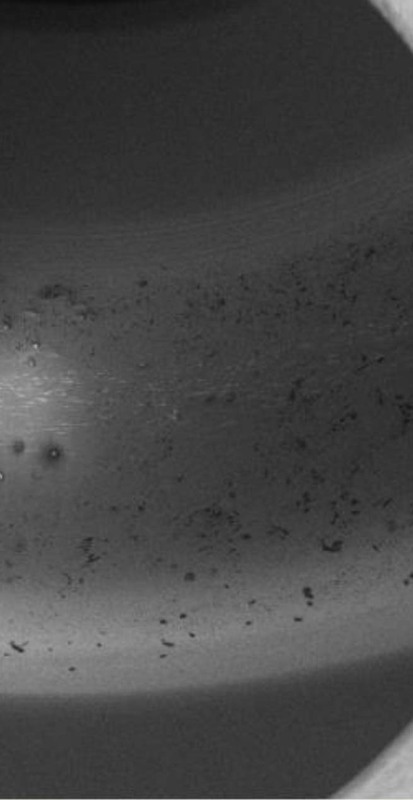 After making the metal-to-metal fitting per manufacturers instructions, a second FESEM image of the surface shows no scarring or scratching, only trace particulate from the silver gasket. Let's scan the fitting to be sure the inert, corrosion resistant silicon surface is really intact. EDS (Energy Dispersive Spectroscopy) is used to map the distribution of silicon throughout the area. Post sealing results show the silicon surface remains intact with no major occlusions or scratches on the surface; assuring a leak free, inert and corrosion resistant surface. Finally let's do a leak test. For this experiment, we'll compare coated and uncoated CF vessels under heating. As the temperature rises, leaks and surface outgassing can also increase. 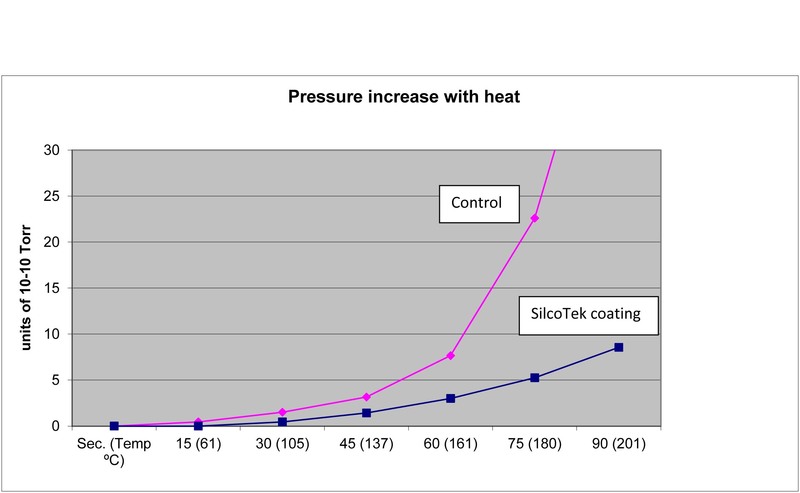 SilcoTek® coatings maximize leak integrity with a very low outgas rate compared to uncoated stainless steel surfaces, even under ultra high vacuum conditions. To install SilcoTek coated tubing all you need to do is follow the manufacturer recommended fitting make-up procedure. Here's an example from Swagelok®. For analytical and high purity applications avoid using snoop or other liquid leak detection sprays. Use an analytical leak detector, they're available from most chromatography supply houses. Here's an example from Restek®. Fittings should also be coated to assure an inert flow path. You don't need to coat the ferrule, just the fitting body. 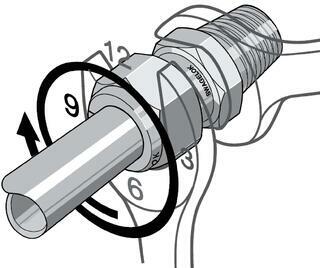 Ferrules are not significantly exposed to the flow path in a properly made up fitting. It's that easy! You really don't have to take many special precautions when installing SilcoTek coated tubing in analytical systems. Just follow sound installation guidelines and the system should provide fast accurate analytical results for years to come. Be sure to pick the right coating for the application. Get our coating selection guide. What about installing tubing? Can I protect tubing and still make a leak tight seal? Are there any special handling, bending, cleaning, cutting or fitting installation procedures? Well it's your lucky day. Here's a handy guide to installing and maintaining inert coated tubing. If you've ever tried to install stainless steel tubing, you know there's some technique to making up connections and making precise bends. 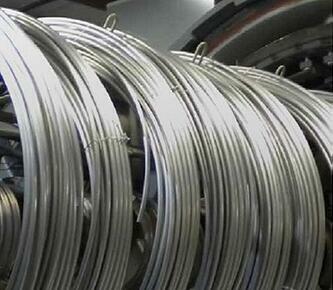 After you get the hang of it, working with stainless steel tubing is not too difficult. The same holds true when working with SilcoTek coated stainless steel tubing. Here are the most frequently asked questions and some quick tips on installing and maintaining inert, corrosion resistant silicon coated tubing. 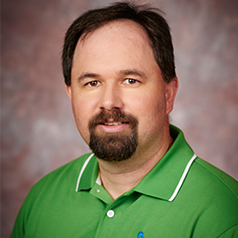 The SilcoTek Technical Service Team has lots of application and test data for your industry. Contact us and we'll be happy to help! Or ask the experts on LinkedIn.